Total return swaps are contracts between two counterparties, under which the total economic risk of ownership of a designated asset or set of assets is transferred from one counterparty to the other. By the total economic risk, we mean not just the credit risk of a particular asset, but also the interest rate risk, and any other more complex risks that may also impact the value of the designated asset or set of assets. 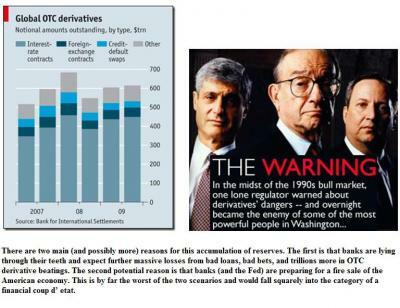 Total return swaps were among the earliest credit derivatives; they pre-date default swaps, although default swaps are now the more commonly traded instruments. The difference between a total return swap and a default swap is that a default swap simply transfers credit risk, typically by reference to some designated reference asset, whereas a total return swap transfers what is, in effect, all the risks of owning the designated asset. Payable semi-annually for the term of the contract. Floating Rate Payment Dates: Semi-annually in arrears, starting six months after the Start Date. Floating Rate Payments: The Total Return Receiver pays the Floating Rate Payment to the Total Return Payer on each Floating Rate Payment Date, until ( and including ) the End Date. Total Return Payments: All coupons and other fees and cash sums payable to holders of the Reference Asset. Total Return Payment Dates: Two business days after the Total Return Payments are Received by the Total Return Payer from the Paying Agent of the Reference Asset. Total Return Payments: The Total Return Payer pays the Total Return Payments to the Total Return Receiver on the Total Return Payment Dates. To understand how this transaction works, imagine that Counterparty B, the Total Return Payer, has bought $10,000,000 nominal of the XYZ Corporation 8% bonds of 2019 in December 1999. What are the Counterparty B's cashflows, if he then also enters into this total return swap? From the bond, Counterparty B will receive coupons, so long as XYZ Corporation doesn't default. Under the terms of the total return swap, however, Counterparty B will not keep these payments, but will immediately pay them to Counterparty A as Total Return Payments. In return, Counterparty A will pay the Floating Rate Payments to Counterparty B; these are LIBOR plus a spread, calculated on the amount that Counterparty B has invested in the XYZ Corporation bonds. So, overall, Counterparty B is receiving a sequence of floating rate payments ( LIBOR + 0.85% ), and that's it, at least until 2004. That is, Counterparty B has created the same effect as entering into an asset swap. 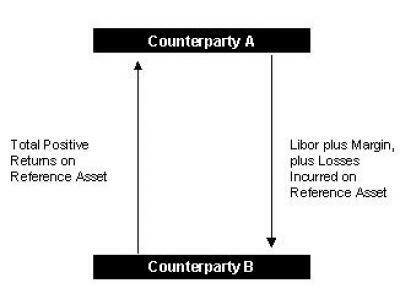 The interesting thing is what happens when the total return swap ends: if the price of the underlying bonds has increased over the term of the swap, Counterparty B pays the profit to Counterparty A; if the bonds have fallen in price, however, Counterparty A will compensate Counterparty B for the losses that B would otherwise incur. So far, the possibility that XYZ Corporation might default sometime between 1999 and 2004 has not been considered. What would happen if XYZ Corporation did default during the term of the swap ? Of course, the bonds would suffer an immediate loss on principal value, and, after a suitable period of time for the lawyers and accountants do their work, the bonds would either be repaid to the best of XYZ Corporation's ability ( presumably with only a fraction of the principal being recovered ) or the cashflows due to bond-holders would be negotiated to some fraction of the original coupons. As far as Counterparty B is concerned, however, this does not matter very much, as whatever cashflows are due from the bonds, whether coupons, early redemption of principal, or other possible cash sums that might arise, are simply passed through to Counterparty A, who continues to pay the Floating Rate Payments as if nothing had happened. At the time the deal ends, if XYZ Corporation has defaulted, the bonds may have no residual value at all, or they may have some; either way, Counterparty A will compensate Counterparty B for the losses that B would have incurred, but for the swap. The effect for Counterparty B is as if he had not owned the XYZ Corporation bonds at all over the period between December 1999 and December 2004, but instead had simply invested the cash in a floating rate asset paying LIBOR plus the spread. Now, consider the total return swap from the point of view of Counterparty A: what cashflows has Counterparty A paid and received, and what has been the economic effect ? Consider first the Floating Rate Payments: under the terms of the total return swap, Counterparty A simply makes a sequence of floating rate payments, in the form of a spread over LIBOR on the Notional Principal Amount of the swap. Now consider the Total Return Payments: under the terms of the swap, Counterparty A receives all the coupons due on the XYZ Corporation bonds, plus any change in the value of the principal over the term of the deal. In the event of a default by XYZ Corporation, Counterparty A is liable for any losses that are incurred by an actual bond-holder, but receives ( through the Total Return Payments ) any principal that might be recovered on the bonds in a default scenario. The economic effect for Counterparty A is precisely that which could otherwise be obtained by actually buying the bonds in the open market, holding them for the term of the total return swap ( five years ) and then selling them again in December 2004. Counterparty A obtains the total investment returns due to someone who someone who bought the bonds in 1999 and held them for five years. By taking on the economic risks of bond ownership ( without actually owning the bonds ) Counterparty A receives the benefits ( and perhaps, the potential disadvantages ) of ownership. In return for receiving the economic effect of holding the XYZ Corporation bonds - that is, receiving the total investment returns on the XYZ Corporation bonds over five years - Counterparty A has paid out a sequence of cashflows whose economic value can be calculated precisely ( we could quite easily go to the interest rate swap market and enter into a deal which exchanges these floating rate cashflows for a fixed sum ). This economic value that Counterparty A has paid out should be precisely that which it receives from the effective economic ownership of the XYZ Corporation bonds. In other words, in an arbitrage-free world the economic value of the two sides of the deal should be the same, once the probabilities of default by XYZ Corporation and the estimated recovery rates in the event of default at different times during the five year term of the deal have been factored in. Consideration of the economic effects of a total return swap suggests that it is very similar to an asset swap. Just as with an asset swap package the cashflows of a fixed rate bond can be exchanged for floating rate ( typically LIBOR-based ) cashflows, so, with a total return swap, the cashflows of a bond are exchanged for simple floating rate ones. The difference is that with an asset swap package the holder of the bond to be swapped retains the bond issuer's credit risk, whereas with a total return swap the holder of the bond passes that credit risk on to some other party. It is this transfer of credit risk which makes a total return swap a credit derivative, whilst an asset swap is not. That said, a great many firms trade total return swaps and asset swaps from the same trading desk. For the total return receiver, the economic effect of a total return swap is very similar to that of buying the underlying asset, and funding that asset through the interbank market. Inspection of the cashflows makes it very clear what the difference is, however. Although a total return swap and an outright purchase of the underlying asset both generate the same incoming cashflows for the total return receiver, the difference is in the outgoing cashflows: under a total return swap, the credit and interest rate risk of holding the asset is taken without the need for an up-front cash payment. Buying a bond requires the total return receiver to pay out a large sum of cash - the purchase price of the bond - but with a total return swap this is not necessary. payable quarterly for the term of the contract. Floating Rate Payment Dates: Quarterly in arrears, starting three months after the Start Date. Total Return Payments: All coupons, dividends, and other fees and cash sums payable to notional investors in the Reference Index. Total Return Payment Dates: Two business days after the Total Return Payments are determined by the calculator of the Reference Index as receivable by notional investors in the Reference Index. If Final Price < Initial Price, the Total Return Receiver will pay to the Total Return Payer the cash amount given by: ( Initial Price - Final Price ) x Nominal Amount. If Final Price > Initial Price, the Total Return Payer will pay to the Total Return Receiver the cash amount given by: ( Final Price - Initial Price ) x Nominal Amount. Index and basket structures in total return swaps allow users to create exposure to a potentially widely-diversified range of credit instruments in a single trade. This is particularly useful for institutional investors such as fund managers, who want to create investment portfolios quickly and efficiently. An index total return swap can be used by an asset manager to assume risk, without the complications of actually calculating the current market values of the components of that index, and then buying these components from what may not always be the most liquid of markets.